Pluto was the most recent major planet to be discovered. It was found in 1930 during a sky survey by American amateur astronomer Clyde Tombaugh at Lowell Observatory in Arizona. Tombaugh died in 1997. Pluto was the name for Hades in ancient Greek myth. Hades was god of the netherworld — the home of the dead. Similarly, to the ancient Romans, Pluto was god of the underworld. The planet may have been given the name Pluto because it is so far from the Sun that it is in perpetual darkness. Another factor may have been Percival Lowell's initials PL. Lowell had founded the Lowell Observatory in Arizona in 1894. Pluto has been a favorite with people on our inner Solar System planet ever since discovery of the faraway body was one of the biggest news stories of 1930. After the planet discovery became popular, Walt Disney named Mickey Mouse's dog in its honor. Moon. Pluto has a natural satellite, Charon, which is larger in proportion to its planet than any moon of any planet in the Solar System. The moon Charon, which was discovered in 1978 by Jim Christy, may be a chunk that broke off Pluto in a collision between the planet and some other large object. Before Charon was found to be a separate body, blurred-together images of Pluto and Charon led astronomers to believe Pluto was a much larger single body. Today, some astronomers think of Pluto and Charon as a double planet rather than planet and moon. The word Charon is pronounced "KAIR en." Alternatively, some pronounce it "SHAHR en." The moon is named for the ferryman who conveyed the dead across the River Styx or the River Acheron to Hades. In Greek mythology, Styx was the river across which the souls of the dead were ferried, one of the five rivers of Hades. Another of the five was Acheron, the river of woe. A long way off. Pluto's average distance from the Sun is 3.67 billion miles. That's 39.5 times the average distance between the Sun and Earth. The small planet is estimated to be 1,440 miles in diameter. That's only 70 percent as big as Earth's Moon. In fact, Pluto is smaller than seven of the Solar System's moons — Io, Europa, Ganymede, Callisto, Titan, Triton and Earth's Moon. Prior to the discovery of Charon, Earth's Moon held the distinction of being the largest moon relative to the size of its planet. Other planets. How does Pluto differ from the eight major planets? Orbit. Pluto has a strange orbit. It was the only one to cross another planet's orbit. Pluto's orbit tilts up from the Solar System plane. It takes Pluto 6 days 9 hours to rotate and 248 Earth years to complete an orbit around the Sun. It's orbit is off-center in relation to the Sun. That leads Pluto across planet Neptune's path. Size. Pluto is less than half the size of any major planet. It's only about two-thirds the size of Earth's Moon. Pluto's diameter is 1,430 miles. That's a mere18 percent of planet Earth's diameter. Moon. Pluto's natural satellite, Charon, is larger in proportion to its planet than any planet's moon. Crossing Neptune. From 1979 to 1999, Pluto was the eighth planet from the Sun. In 1999, it crossed Neptune's path to again become the Solar System's most distant planet. It will remain in the ninth position for 228 years before crossing inside Neptune's orbit again. Pluto and Netpune will never collide because their orbits are very different. Pluto can be visualized as above Neptune in the orbital plane. The two bodies always are separated by more than a billion miles. Pluto's origin. The dwarf planet's origin is unknown. Some astronomers suggest Pluto may have been a moon of Neptune that escaped. Others say Pluto might be a comet or asteroid which wandered in amongst the planets from a region just outside the Solar System known as the Kuiper Belt, which is said to contain comets that orbit the Sun in a plane similar to the major planets. Pluto was the only one of the nine planets that had not been visited by a probe from Earth. A one-way trip from Earth to Pluto would take an interplanetary probe a dozen years. 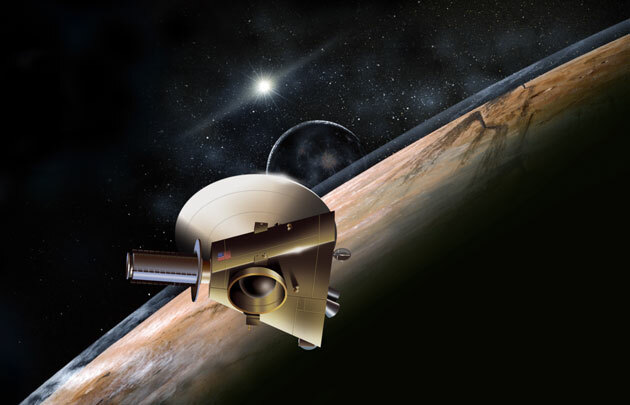 New Horizons will arrive at Pluto in 2015. Pluto was reclassified into a new category of dwarf planets on August 24, 2006, by some 2,500 astronomers from 75 nations, meeting as the International Astronomical Union.